As you all know, I am a huge foodie - as a winemaker, being passionate about food comes along with the job, right?! Ironically, breakfast is my favorite meal of the day. I think this is funny because wine really doesn’t “pair” with breakfast, but I am up for that challenge (stay tuned for when I launch my new youtube series). Once we woke up, we searched for the top rated breakfast spots in Menlo Park / Palo Alto. We landed upon Quattro …and as soon as we arrived I had to order a cappuccino! I usually order black coffee and add cream or milk to it, but since I am on a trip, I decided to feel a little “fancy” with this choice. How could you not smile when you know you’re about to have a delicious cappuccino?! This delectable beverage was even served with cinnamon dusted shortbread cookies. Let. me. tell. you…they were too good to be true! 10/10 would order again. I forgot to take a photo of what I ate ( I was too hungry and forgot LOL) but, I ordered a three egg omelette with fresh goat cheese, mushrooms and asparagus. After breakfast, we went back to the Airbnb to get some work done. When I am away, I always make time to get things done for RedHead so I can keep you all in the loop and ensure the wine is readily available in your markets! I love what I do and love keeping up, regardless where I am. But, in the meantime, I was waiting for my best friend, Lexi, to arrive in Menlo Park. When I used to work in Modesto, Lexi and I met at a mutual friend’s house and have been friends ever since. I haven’t seen her in over 2.5 years (since I moved back to Ohio! ), so I was counting down the minutes! These hallways stretched on forever! The photo doesn’t do the architecture justice! My sister, Michelle, standing outside Stanford’s famous church. Stanford has a lovely viewing tower that allows you to see all of campus and the San Francisco bay. Stanford is so beautiful, that I feel showing you rather than telling you is a better way to showcase my time there. To learn more about Stanford, check out there website here. After walking for a few hours, we ventured off campus to a well-known (according to google LOL) pho restaurant celled, hometown noodle. It’s a very small and quaint place, but…wow….their pho is probably the best I have ever had in my entire life, thanks google! Overall, day three was a simple day still filled with adventure, friends and amazing food (are you surprised?!). We really had a great time together and the day flew by fast. If you’re looking to learn more about my experiences or have questions / comments about what I did, tweet me at @RedHeadWine. We spent the earlier part of the day getting work done and preparing to fly back to Ohio. 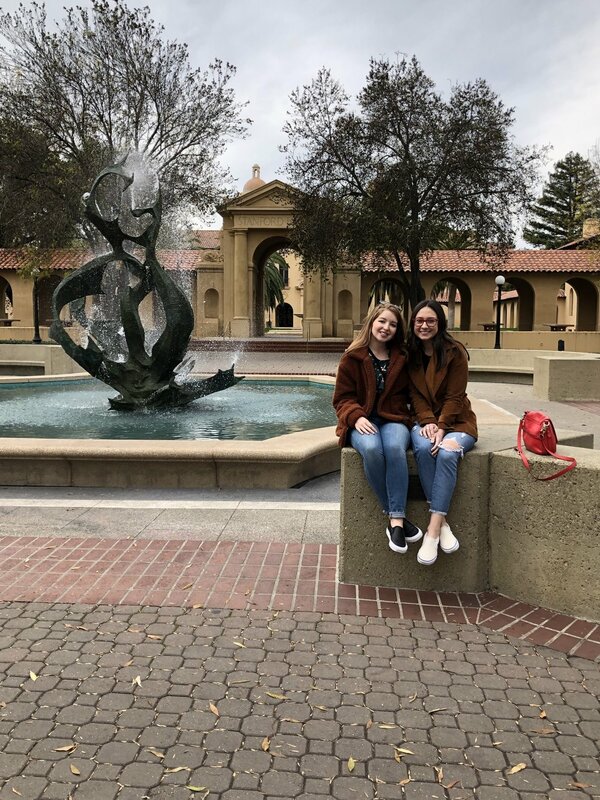 But most of our adventures happened in the evening- we wanted to hit up downtown Palo Alto which is full of fun places to eat! Salty, sweet, fudgy, and simply unforgettable! We pump up the coconutty goodness of our extra-rich coconut ice cream by blending in dark-toasted shredded coconut, then add in handfuls of homemade (gluten-free!) salted chocolate chip cookies and velvety-soft chocolate ganache made with almond milk. Uhmm…how amazing does THAT sound???!! 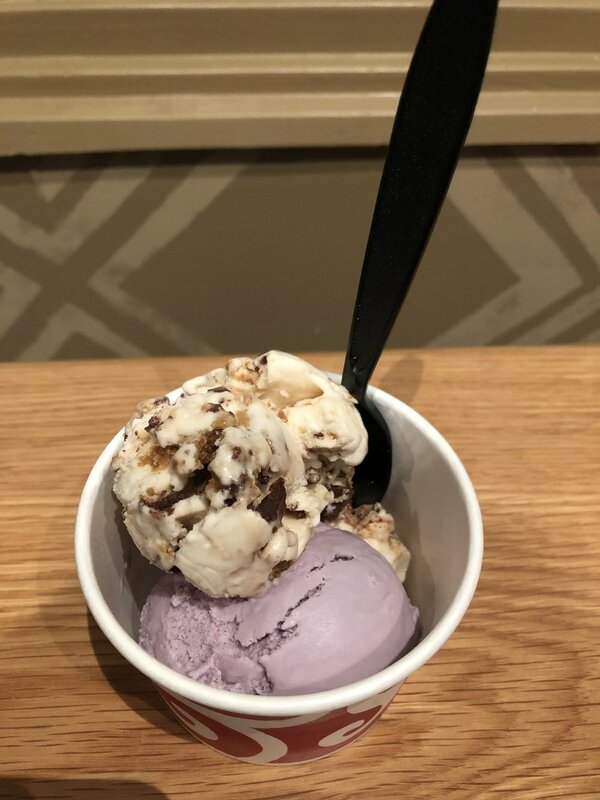 I wish I could indulge in a scoop…or two..while I finish writing this blog! Last stop of the night before wrapping up the trip was a quick stop at Signona’s Farmer’s Market. Before heading to the west coast, my grandma requested that we pick up authentic jumbo CA raisins. We were worried we would not find any, but, Signona’s for the win! They had a dried fruit bar at the store- full of endless options! We may or may not have bought a mountain of dried fruit …. Stumbling upon Signona’s was the perfect way to end the trip - a great place to shop and find unique foods while grabbing some authentic CA raisins!